Need to take a verbal test as part of your graduate assessment? JobTestPrep has created an exclusive practice hub to help you ace the exam and get the graduate job or scheme you want. Start practising now, or scroll down to try a free sample question and to read our tips. If you are applying for a graduate position, you will likely be required to complete a verbal reasoning test as part of your assessments. There are many types of graduate verbal tests, each with its own unique features, and it’s important to get to know them in order to pass the test. JobTestPrep has created a Verbal Reasoning PrepPack™ for graduates so you can be ready to score high and get the job. JobTestPrep offers the web's largest preparation hub for graduate verbal tests, including over a thousand practice questions. Our PrepPack™ provides a comprehensive learning experience, complete with video tutorials, study guides, and full answer explanations. The pack is specially tailored for graduates and will help you prepare for various graduate verbal reasoning exams, such as the CEB SHL, Cubiks, Kenexa, Saville, Talent Q, Criterion Partnership, cut-e, and Watson Glaser tests. CEB SHL's Verify verbal reasoning test is the most common verbal test for graduates. It is comprised of 30 true/false/cannot say questions and has a time limit of 19 minutes. IBM's Kenexa verbal reasoning test is comprised of six passages, followed by 24 true/false/cannot say questions. It has a time limit of 18 minutes. The Cubiks verbal reasoning test is comprised of 40 true/false/cannot say questions and has a time limit of 20 minutes. The Korn Ferry's Talent Q Elements verbal test is comprised of five passages with three multiple-choice questions per passage. This test is unique because it contains six (rather than three) possible answer options, sometimes has more than one correct answer, and is adaptive. This test contains 15 questions and has a time limit of 75 seconds for the first question of each passage and 60 seconds for the remaining questions. The cut-e verbal ability test is unique because while it contains the same basic features of other verbal reasoning tests, information is given in short paragraphs in individual tabs that must be navigated quickly. It is comprised of 49 true/false/cannot say questions and has a time limit of 12 minutes. The Criterion Partnership Utopia verbal critical reasoning test consists of four passages, each followed by four true/false/cannot say questions. It has a time limit of nine minutes. The Saville verbal analysis test is comprised mainly of multiple-choice questions, but also features some true/false/cannot say questions. There are four questions per passage, though the number of passages varies between employers. The time limit is three minutes per passage (four questions). The Pearson Watson Glaser test consists of 40 questions and has a time limit of 30 minutes. It is unique because it contains five different sections: drawing inferences from facts, recognition of assumptions, deductive reasoning, logical interpretation, and evaluation of arguments. What Is a Graduate Verbal Reasoning Test? Graduate verbal reasoning tests may be presented in various formats, though most assess the ability to comprehend and analyse a given text and arrive at conclusions based on it. The most popular verbal reasoning test format for graduates requires you to determine whether statements presented to you are true, false, or cannot say, based solely on the text. Many graduate employers use verbal reasoning tests in the recruitment process, but they are most common in recruitment for consulting, investment banking, and graduate management roles, for example, a leading financial services company, Macquarie, include these tests in their Macquarie psychometric assessment. You may be asked to take the test online at the beginning of the process, or as part of the assessment centre. Verbal reasoning tests may vary in their style and format according to different test providers - JobTestPrep offers preparation resources that mirror the style of different test providers to give you the best chance of success, for example, Cubiks online assessment preparation. Statement: Both employees and the company benefit from the process of performance management. 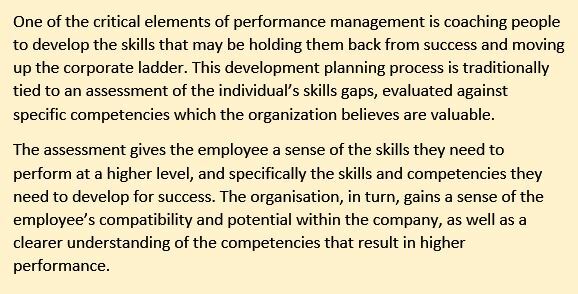 According to the text, 'The assessment gives an employee a sense of the skills they need to perform at a higher level, and specifically the skills and competencies they need to develop for success', while 'The organisation, in turn, gains a sense of the employee’s compatibility and potential within the company, as well as a clearer understanding of the competencies that result in higher performance'. Therefore, the statement is True. Research the test – It is important to know which type of test you will be required to take and then to find out everything you can about it. Read the questions before the text – This will help you understand what information is important so you can answer the question. Don't use any previous knowledge – The text will contain everything you need to know to answer the question. Don't rely on any general knowledge to answer it. Be prepared – It is essential that you take the time to understand how to answer these kinds of questions. JobTestPrep is here to help you learn the tricks behind different verbal reasoning tests so you can feel confident on test day. CEB SHL, Kenexa, Watson Glaser and other trademarks are the property of their respective trademark holders. None of the trademark holders are affiliated with JobTestPrep.